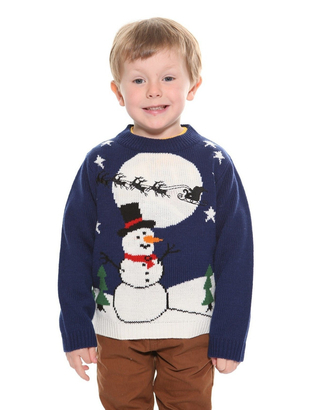 The adorable Child's Snowman Christmas jumper is the perfect touch for the Christmas Holidays. The long sleeved jumper is blue in colour with a round neck line with a sleigh, moon and tree applique on the front. To complete the look a Snowman applique also features on the front.